Most Saturday and Sunday mornings, I wake up, put on my best exercise gear, grab my bf and head out for brunch but there are some Sydney spaces where exercise gear (even the fancy and expensive brands) are just unacceptable. Woollahra, Paddington and Bondi are just a few areas in Sydney where going to a touch more effort, might make you feel more like you’re dining in style. By effort, a simple skirt some sweet sandals and a dressy tee can do the trick. This grey marle skirt from Witchery is prefect. Appropriate for work, nights out and brunch dates, it all depends on what you team with it. So where’s the best places to take this sweet little skirt too? 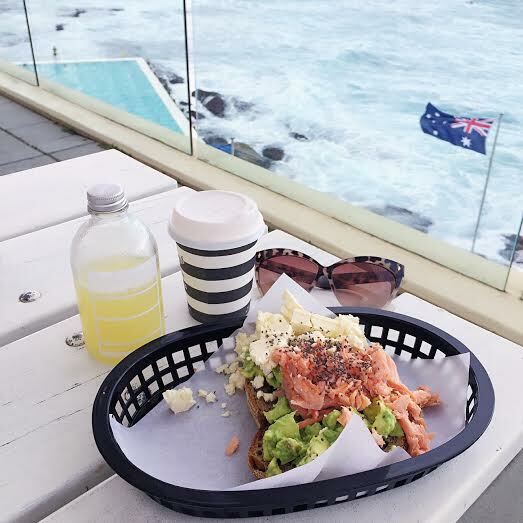 There’s a few but one of my faves is Bondi Icebergs for brunch. The most insane view and the perfect spot to take visitors to Sydney to for a healthy brunch and some Sydney sunshine. Paddington and Woollahra go hand in hand with the term ‘posh nosh’, they are two of Sydney’s luxe suburbs and most of the eateries in the area are definitely not exercise attire appropriate. Flat White is great for food but the service is a little underwhelming. It’s one of those places where you have to wait for a table but you aren’t really greeted or put on a list. The baked eggs totally made up for the lack of friendly service, you can opt for smoked trout or chorizo and potato and both are fine choices. One of my favourite areas in Sydney in Summer is Paddington, lined with rows upon rows of jacaranda trees. Gusto is the perfect spot to meet friends for brunch and go to that extra bit of effort in the fashion department. Their breakfast dishes are super healthy and there is so much to choose from. I love a little smoked salmon with avocado and loads of lemon. it always fills the void and I leave filling full but not overdone. It’s the perfect place to dine on some delicious eggs, shop around Thomas Dux and wander through the jacaranda filled streets of Paddington.